Free Park & Wait Lot / Cell Phone Waiting Lot - where drivers wait in their vehicles, while passengers deplane, pick up luggage and walk to the curb for pickup. The lot is located on your right as you enter the airport, south of Terminal One. The lot has large electronic flight information signs displaying flight arrival information. Once the flight has arrived and time allowed for luggage pickup, the sign displays the rready for pickup message. Economy Parking Lot - located south and west of the terminal buildings. Free shuttle service every 5 minutes between the parking lot and terminals. 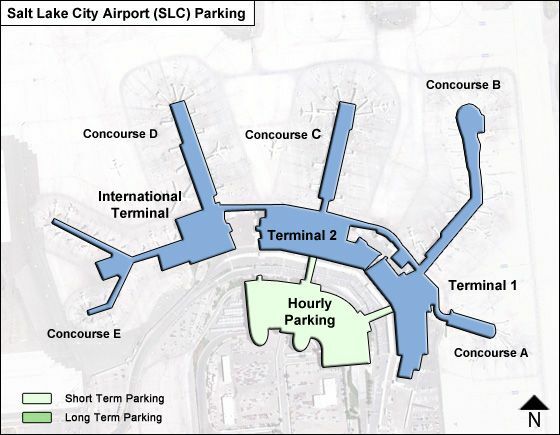 Hourly/Daily Parking Garage - located directly southwest of the terminals. Level one: hourly parking only. Disabled parking available on all three levels of the garage and around each shuttle stop in the economy lot. For more information, call AMPCO System Parking at 801-575-2886.